In this solo dining adventure, Gary finally gets around to trying the burger at Sweet Afton, his local watering hole. Ever since Sweet Afton opened in my neck of the woods just about a year ago, I’d been told repeatedly by friends that I just had to go there. It makes sense – a bar that’s less than a mile away serving craft beer and good food, the former we have little of in Astoria and the combination of both even scarcer. I could be wrong – there are, after all, plenty of Euro restaurants and bars on Broadway that could have good beer and good food but I’m fairly certain that’s not the case. Sorry if that sounds a bit harsh but the stuffy Euro douche clientele doesn’t leave me with much hope. When I finally visited Sweet Afton some months back with some college friends for Sunday brunch, I was excited to see what many Astorians had been raving about. So we brunched, the three of us pretty much going through the limited menu. Everything was solid and they did indeed have a nice selection of craft brews but I wouldn’t say I was overly impressed. That was, I was told, because I didn’t have their burger. Being the burger aficionado that I am, that’s obviously a remark meant to bait me into giving the place a second try. Months later, tired and hungry after a long bike ride (45 miles in the Five Boro Bike Tour, to be exact), we returned in hopes of replenishing all those lost calories with a burger. Unfortunately, we got there after the kitchen had just closed (from 4:30pm to 5pm, seriously) – even worse, we were told so and handled in about as rude a manner as possible. We moved on and while I wouldn’t say they were on my black list (permanent ban), it would be some time before I’d want to go back there. Only a few weeks later, my friend Susan texted me late on a Sunday afternoon to see if I wanted to grab a burger that night. She lives in Astoria as well so, yes, it would be at Sweet Afton. Sometimes when it seems like the fates have conspired to force you into a decision, it’s best not to fight it. Sweet Afton it was. As always, I ordered my burger medium-rare. Unfortunately, they served me one cooked medium. A setback but not a big one, certainly not one worth sending back to the kitchen; cook it well-done and then we’re talking about getting a new one sent out. It comes with all the usual suspects – lettuce, tomato, onions, and pickles. Oh, a bun too and a massive one at that as you can see below. When you take away all the vegetables that came with it and just have the burger between two halves of a bun, the bun really sticks out. Too much so in my opinion as it quickly became a chore to eat – dense, chewy with not nearly enough give when biting into it. The beef itself was wonderful – just enough salt and a real meaty flavor. Yes, it’s Pat La Frieda beef but if you think that makes it an automatic thumbs up, please read my review of Flip, an example of how La Frieda beef can’t save shoddy execution. Besides the beef, both the bun and the pickles are locally sourced as well; that doesn’t make it any better but they certainly get points for the effort. 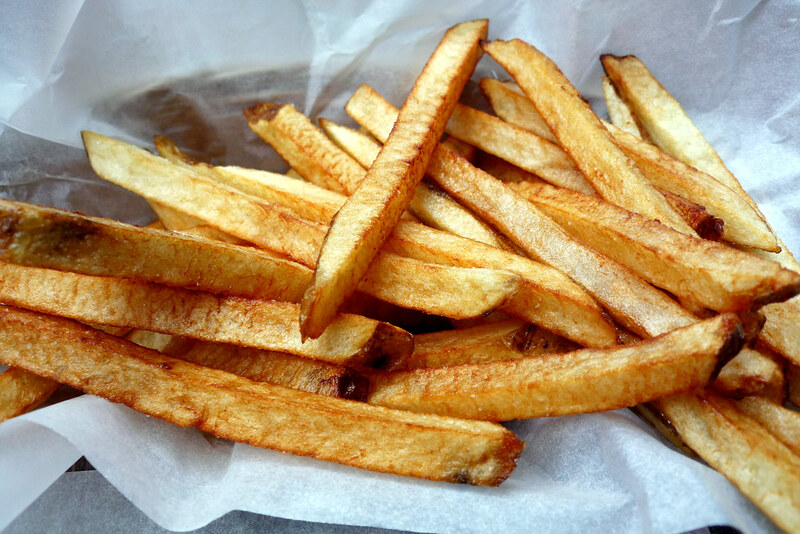 The fries here are hand cut, all seemingly to a very healthy length and width. They looked good when they came out but they weren’t as crispy as I would have preferred, edging closer to soggy than fries should ever be. Since they were already limp, the provided malt vinegar didn’t hurt them any. Could my meal be salvaged by, of all things, fried pickles? Why yes, yes they can. Unlike other fried pickles I’ve had, these were chips not spears. Also, instead of a light batter, they go another route with a batter that’s thick and almost fritter-like (think the kind of batter you’d see at places that deep fry Twinkies or Oreos). The end result is a light, chewy nugget where one bite will release plenty of steam but then you get the sour tang of the pickle. Paired with their smokey sauce, it’s a really nice side for the burger. While it’s clear that I wasn’t quite in love with the burger because of the bun, there’s no reason why I wouldn’t recommend having it. 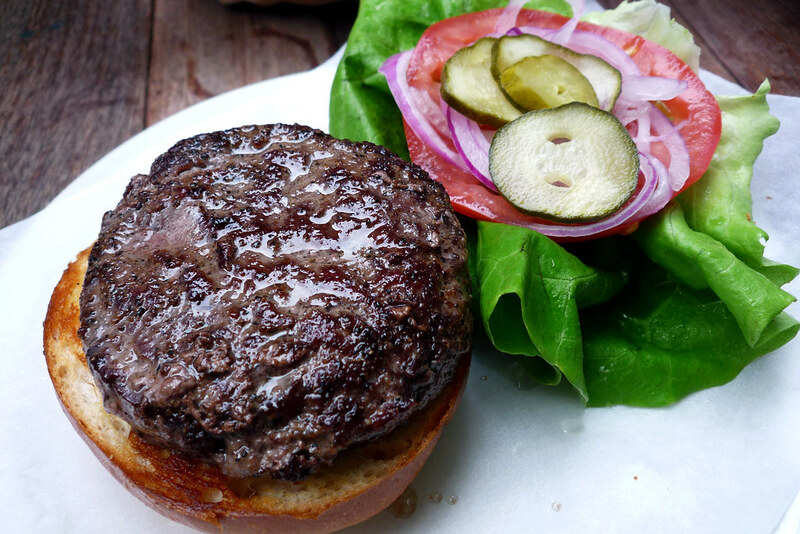 Bun aside, it really is a good burger, just one that takes a lot of work to eat if you actually keep all of the lettuce, tomato, onions, and pickles on them. My advice? Ditch the rabbit food and just eat the burger naked. 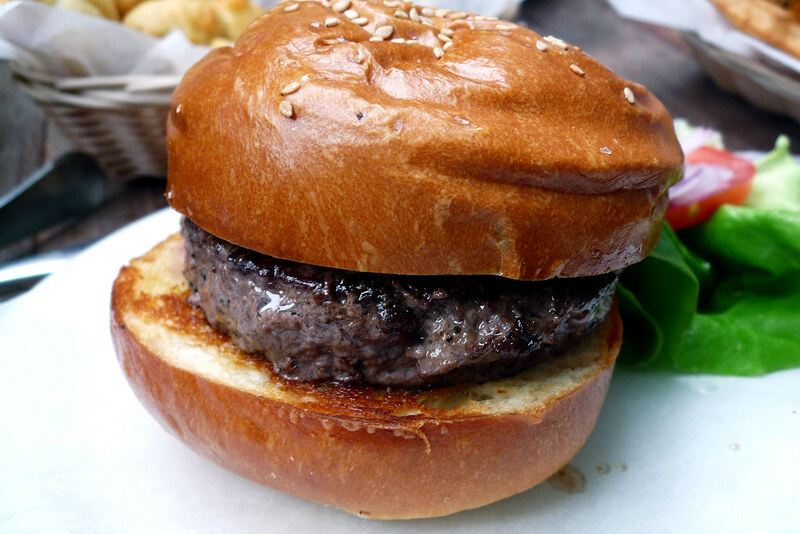 The bun won’t be as cumbersome then and you’ll really be giving the beef a chance to shine. 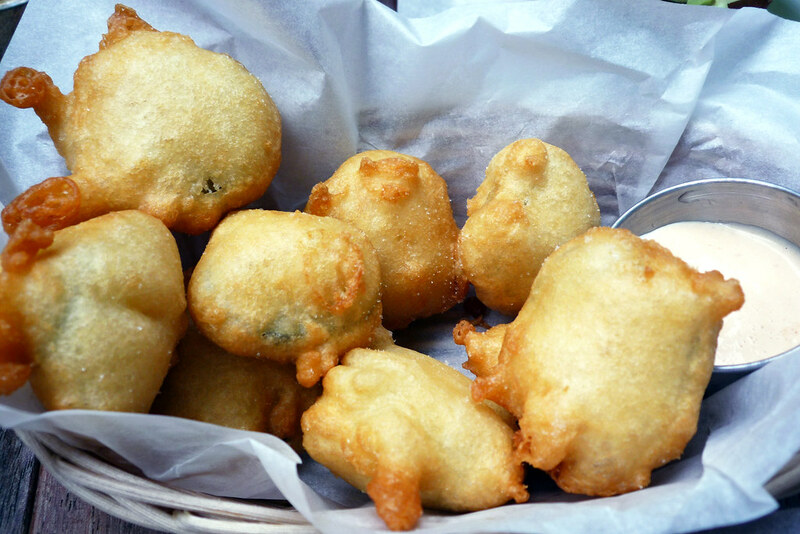 Oh, if you’re a fan of pickles and a fan of deep frying them, forget about the fries and just go for the fried pickles. You’ll thank me later. Sweet Afton. 30-09 34th Street, Astoria, NY 11103. [Show/Hide Map] (718) 777-2570. I was not a huge fan of the burger either – I’ve had it a couple times and one time was WAY better than the other, but still neither was as good as bareburger. You probably won’t want to try it because of all the cheese, but their mac n’ cheese is great and comes in a little skillet. I wholeheartedly agree on the fried pickles, best thing there. I know you’re not a cocktail fellow but they’re great there too. Sometime you should go on a dining adventure with ME in Astoria! We could try either the five napkin burger (though you’ve been to one already, right?) or the new Astor Bakery for their burger (and a cupcake for me). Nice post. @Claire We DEFINITELY need to go on an Astoria dining adventure sometime. 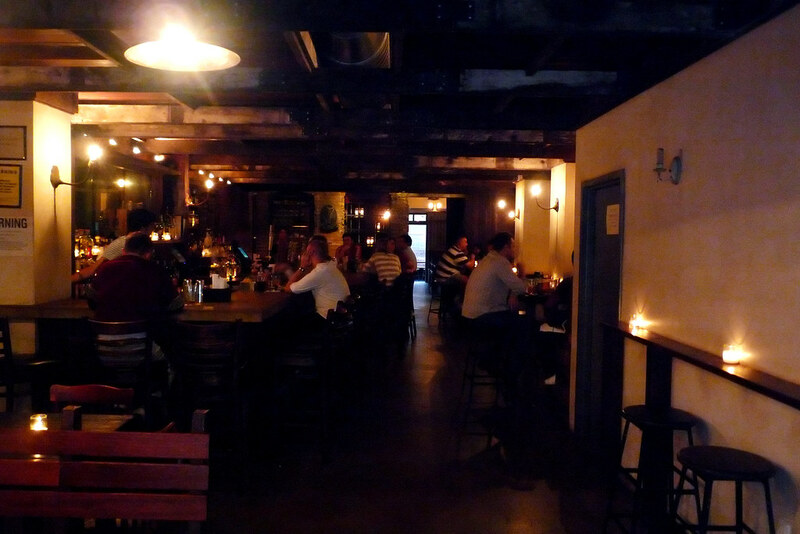 I actually haven’t been to Five Napkin in Midtown so the local one sounds like a good idea.